By weeks four and five, you begin noticing that your chicks look a bit “unkept” as their fluffy appearance slowly disappears and their fuzzy down is replaced with feathers of a mature bird. Chicks will usually be fully feathered by 5 to 6 weeks of age. You also observe their wattles and combs growing larger and taking on a deeper red color. Your babies are growing up! As they mature, chicks naturally establish a “pecking order” which determines each chick’s social position in the flock. Their place in the order will determine who eats and drinks first and ultimately who “rules the roost.” This order is determined early in life and is completely normal. Although establishment of a pecking order is normal behavior, you should be watchful for excessive pecking in chicks as it may indicate a more serious problem, cannibalism. This is when birds peck the feathers and other body parts of other birds and if allowed to get out of hand, can lead to bleeding, open sores and even death. Cannibalism can occur at any age and needs to be controlled as soon as it rears its ugly head! It is costly and can spread through a flock rapidly if left unchecked. Cannibalism is usually the result of stress, which can be caused by poor management. Some of these stressors may include crowding, excessive heat, bright lighting, noise, hunger, thirst, the presence of sick or injured chicks, and parasites as well as any other factor that causes stress. Providing the correct living environment in terms of these factors will help reduce the potential for cannibalism from occurring in your flock. 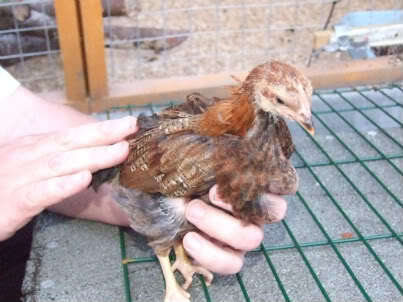 Your chicks require less heat as time goes by and they grow larger and more able to regulate their body temperature. Continue reducing the temperature each week to keep them comfortable to a minimum of 65°F. Continue providing clean fresh water each day and providing unlimited Sunfresh® Recipe Start & Grow® in their feeders. As your chicks grow, adjust the height of the feeders and waterers. A good rule of thumb is to keep them adjusted to the birds’ back height while standing. This will help to keep litter out of feeders and waterers, as well as curious chicks! Around 4 weeks of age, ducklings and goslings will thoroughly enjoy the addition of a swimming area. Be sure if you provide this to keep any resulting wet litter cleaned up! Because of their water-loving, messy nature, it is best to separate ducklings and goslings from chicks. Maintain good sanitation practices to reduce the chance of disease. Bigger chicks make bigger messes! As the chicks grow, make sure they have sufficient space to prevent crowding. Additional feeders and waterers may need to be added now to allow adequate space for all chicks to eat and drink at the same time. Keep a close eye on your chicks for signs of possible health issues. Chicks that are sick may appear droopy, listless, have diarrhea or be unwilling to eat. Your chicks will soon be mature enough to leave the brooder and move into more permanent living quarters, the chicken coop. If you don’t have one ready, now is a good time to start looking into getting one and preparing it for new occupants. You’ll be surprised at how fast your chicks will grow and how quickly moving day will arrive! Many types of poultry housing are available for purchase or you can venture to build your own. This entry was posted on Wednesday, April 23rd, 2014 at 9:23 am	and is filed under News & Updates. You can follow any responses to this entry through the RSS 2.0 feed. Both comments and pings are currently closed.